In a college or a workplace where you have to use a VPN via proxy or a proxy server to surf the internet? But when you come back home you need to disable the proxy again to use your home Internet? Go to your Internet Settings, then the connections tab and then click on LAN Settings, type the proxy, check or uncheck the check box, click OK and then OK again. Alternatively in Windows 8 and above, you still have to make a couple of odd clicks drag to turn proxy on and all that. How about a single click enable and disable your proxy server? It is possible and trust me like a lot of other things in Cyber Space this is also just a trick. All you need to know to do this trick is to make a couple of clicks and type one character. Is it that easy ? yes. 1. Go to your Internet Settings, navigate to the connections tab and click on LAN settings. It should show you something like this. 2. Type in your proxy settings, and enable or disable it as you like. For now it doesn’t matter. 3. Press the windows button + R together to open the run diaglog box. Type in regedit and press enter. Alternatively you could search for regedit on your C:Windows folder path. 6. Let’s say you have the file at your desktop. Now right click on the file and open it with notepad, preferably notepad++ or such similar notepad. 7. Find “ProxyEnable” in this document. A dword value after that will be written. This looks like in the picture. Change is value to 00000001 and save this file as “enable.reg” on the same path as your disable.reg. 8. What now? You are done. Double Click enable to enable proxy and click disable to disable. 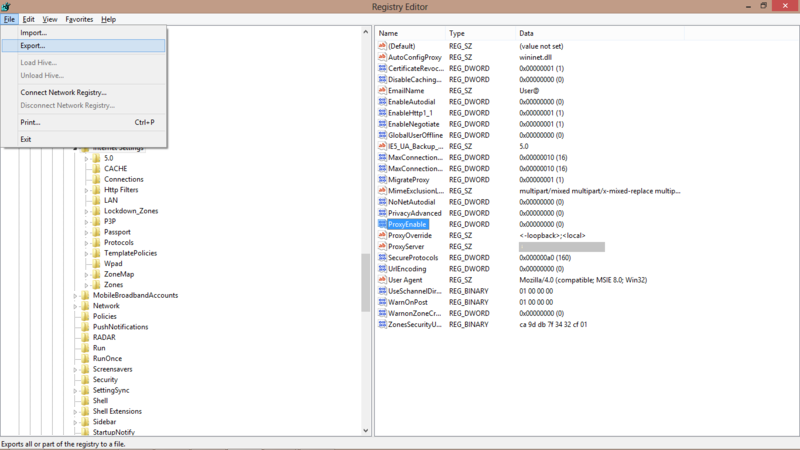 For the lazy ones, here are the two registry files.